"Door to Door" Democratic Minority Leader Tom Daschle (D-SD) battled to keep his leadership seat in the U.S. Senate in a close and contentious battle against republican challenger John Thune. But after 26 years in Congress Daschle lost the race by a narrow margin. 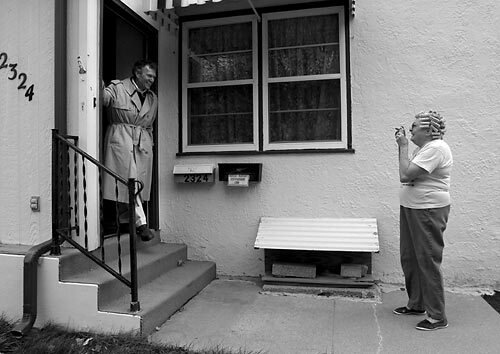 'Daschle's Loss - Door to Door' While democratic Minority Leader Sen. Tom Daschle (D-SD) campaigning and speaking to constituents door to door Delores snaps pictures of the Senator in a neighborhood of Sioux Falls, South Dakota, Saturday October 30, 2004.